Materials and Care: 100% polyester. Hand wash only. Available Sizes/Colors: Size "XS (4-6)" "S (6-8)" "M (8-10)" "L (10-12)"
Girls love the pretty prairie dress detailing on our Pioneer Girl costume set in children's sizes from Candy Apple Costumes. The light blue floral print long-sleeved dress has an attached pinafore apron. Eyelet lace decorates the sleeve cuffs. 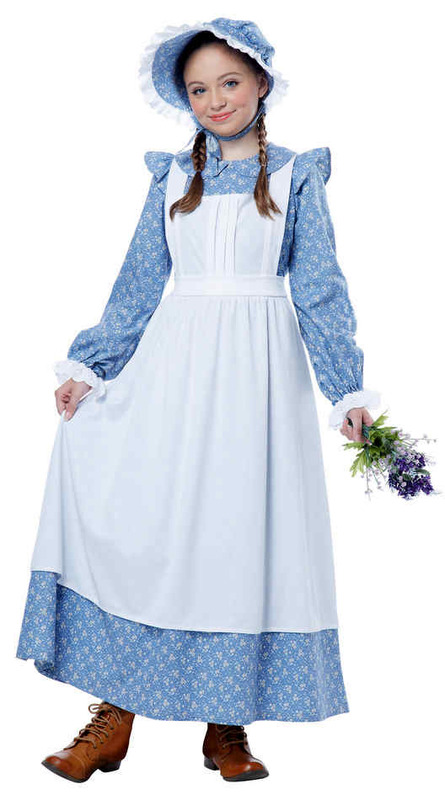 A blue floral bonnet with eyelet lace trim is included with this popular pioneer dress costume set for girls. Our custom sizing chart for this costume can help you decide on a girl's extra-small, small, medium or large.